A labyrinthine descent into the grotesque extremes of a Disneyfied society, “Escape From Tomorrow” is surreal for many reasons and wholly original because of them. It’s also a daring attempt to literally assail Disney World from the inside out. This loosely constructed, starkly black-and-white directorial debut of Randy Moore, which follows a family on their twisted final day of vacation in Disney World, takes place throughout the theme park behemoth and appears to have come together without an iota of permission. Moore portrays Disney World as the ultimate horror show — and gets the point across in nearly every scene. Beyond the issue of whether or not it has the legal right to exist, however, “Escape from Tomorrow” displays a fascinating ingenuity in its appropriation of the Disney brand. Seeming everyman Jim White (Roy Abramson) awakens at the start of the story to learn that he has lost his job for inexplicable reasons, the first of many hazy events that immediately convey a Kafkaesque feel. Rather than share the news with his nagging wife (Elena Schuber) or feisty young children (Katelynn Rodriguez and Jack Dalton), he keeps it secret as they set about a chaotic day in the park. Familiar Disney amusements zip by: The family rides the monorail, photographs the Magic Kingdom, rides around in teacups and passes by hordes of familiar characters from the Disney toy chest. For Jim, however, the excursion fails to provide an exit strategy from his woes and instead puts his sanity at stake. In short order, he starts suffering from blackouts and bizarre visions of devious behavior, including villainous versions of his family and monstrous animatronics come to life. 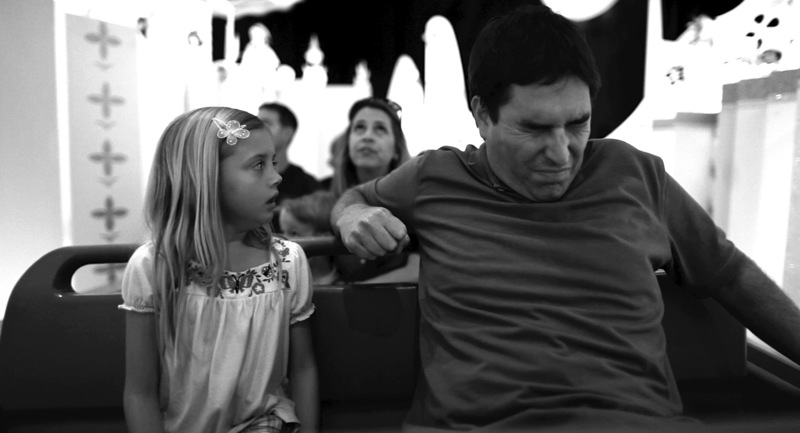 At first it seems likely that Jim has simply lost his mind, but as “Escape From Tomorrow” proceeds it raises the tantalizing possibility that Disney World has as many screws loose as he does. When his nagging wife takes one of their children to another part of the park, Jim undergoes a series of unseemly experiences, including one inexplicable sexual encounter and an ill-fated attraction with a pair of giddy French teens. There’s also an ominous wheelchair-bound man potentially stalking Jim at every corner and a park nurse who claims they’re all prone to a lethal airborne virus. Good luck picking through the fragments, but even when it doesn’t entirely add up, “Escape From Tomorrow” manages to make each disorienting moment count, and the payoff is intensely engaging: a quasi-science fiction climax set against nighttime fireworks and pulpy B-movie clichés rendered in a cavalcade of baffling mayhem. The obvious takeaway is that Disney not only has the power to drive us mad, but it may already have. Save for a canny bleep, the company’s name never gets mentioned — but the movie is littered with the iconography it repeatedly indicts. Considering the conditions of the guerilla production, it’s no surprise that some scenes suffer from a scrappy quality that occasionally distracts from the complex layers of storytelling taking place, although even when “Escape From Tomorrow” shows its seams, the underlying theory holds together: The use of some non-park sets and green screen effects elaborate on the virtual quality of the narrative. At its best, “Escape From Tomorrow” conveys a phantasmagorical nightmare on par with something Terry Gilliam might have dreamt up in his “Brazil” days. But the weirdness gives it definition, but the inherent polemics make it click, particularly once the park footage takes on a quasi-documentary aspect: Moore provides a new context to fluffy imagery by giving it near-gothic dimensions through frightening circumstances and chiaroscuro visuals. That’s certainly the case for Jim, whose deteriorating mind becomes a cog in the machine, whether or not anything around him has tangible definition. Moore eventually singles out Siemens, the global entity largely responsible for the technological realization of Disney’s theme parks, by transforming it into a menacing foe intent on hoarding the power of imagination to fuel murky agendas. Blatantly constructed to provoke the ire of the billion-dollar entity in its crosshairs, the movie gets the point across through the sheer rebelliousness of its production. The chaos epitomizes the ills of glossy fantasy when endowed with authority. “It’s just pretend, right?” asks one of Jim’s kids during a particularly creepy ride. With its ghoulishly unsettling finale, “Escape From Tomorrow” leaves that question wide open. HOW WILL IT PLAY? Cinetic has taken on the daunting task of repping sales for the movie at Sundance, where it premiered in the Next section. While Disney has yet to respond to the movie’s existence, any distributor willing to tackle this one will need a very tricky legal strategy. At the very least, however, “Escape From Tomorrow” has the potential to accrue major cult value.